Eltronicschool. - This is one of the solar circuit schematic application for portable solar lantern using 3V8/1W white LED like in Figure 1. below. The main component are usd in this circuit schematic are 6V/5W solar panel and the 3V6/1W White LED with toher component complement. In this time, based on all component mentioned before, we will give you one of electronic circuit schematic of Portable Solar Lantern using 3V6/1W White LED. Circuit schematic like in Figure 1 above is Portable Solar Lantern using 3V6/1W White LED. 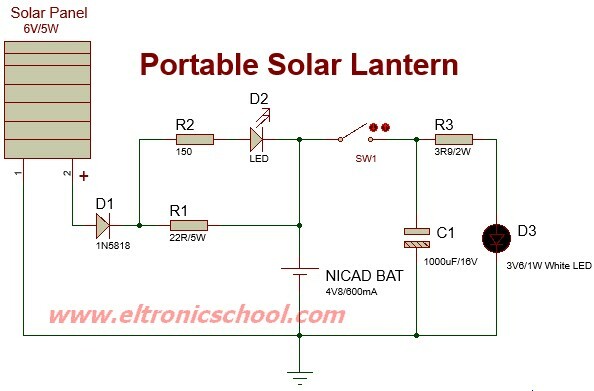 From Electroschematic site that also published this circuit describe that this portable solar lantern circuit uses 6 volt/5 watt solar panels are now widely available. With the help of such a photo-voltaic panel we can construct an economical, simple but efficient and truly portable solar lantern unit. Next important component required is a high power (1watt) white LED module. When solar panel is well exposed to sunlight, about 9 volt dc available from the panel can be used to recharge a 4.8 volt /600 mAh rated Ni-Cd batterypack. Here red LED (D2) functions as a charging process indicator with the help of resistor R1. Resistor R2 regulates the charging current flow to near 150mA. Assuming a 4-5 hour sunlit day, the solar panel (150mA current set by the charge controller resistor R2) will pump about 600 – 750 mAh into the battery pack. When power switch S1 is turned on, dc supply from the Ni-Cd battery pack is extended to the white LED (D3). Resistor R3 determines the LED current. Capacitor C1 works as a buffer.